As summer draws to an end, the herdsmen and women who have tended the cattle on the high Alpine pastures, bring the animals back down to the farm where they will be kept indoors until the snow starts to the melt and temperatures rise. As the shepherds prepare to say farewell to the lush green high Alpine pastures, others are busy making creative headdresses for a special ceremony when the cattle return back to the valley. The heads of cows are crowned with headdresses made of fir branches, Alpine flowers, feathers and ribbons. Often in SalzburgerLand, you will see that the headdress also includes religious symbols, or a picture of St.Leonard, the patron saint of animals. Before the cattle head back down to the valley, cow bells are hung around their neck in order to keep the demons at bay. Depending on the rank in order, the cow bells are either large or small and can be heard from afar. The herdsmen and women, dressed in their lederhosen and dirndls, stay at the rear of the procession in order to make sure that all the cattle return to the farm safely. The elaborately decorated headdresses that the cows adorn in the Almabtrieb are made on farms all over SalzburgerLand. In the Fuschlsee region, it is possible to witness the farmer’s wife making these headdresses. On the rustic Grögernalm, between Faistenau and Hintersee, the farmer’s wives and herdswomen congregate together to make the headdresses. Schuhplatteln was first documented in the year 1850, with a group made up of young hunters, farmers and woodcutters. Why are there no girls? Well, it is said that the group consists of unmarried men and that the impressive dances with plenty of thigh and sole slapping, as well as some impressive footwork, attracts the most beautiful girls! At the beginning of the Bauernherbst period, a special atmosphere ascends over the villages that partake in the festivities. Guests enter these villages to find artistic displays of hay figures and decorations. 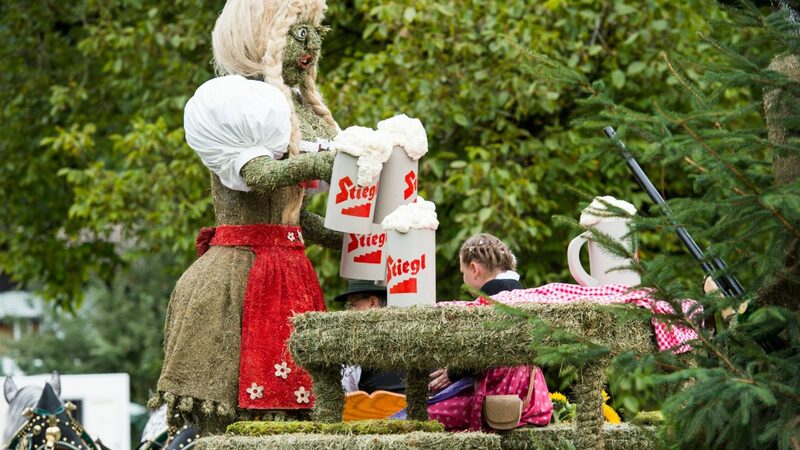 At the Salzburger Lammertal, there is an impressive procession of old-timer tractors and wagons (pulled by Noriker and Haflinger horses) transporting these creations made of hay. Festivities are accompanied by performances from the local whip cracking and folklore clubs. Bauernherbst offers numerous opportunities to learn about regional herbs from the local experts. During the summer months on the Alpine pastures, medicinal herbs have been harvested and dried and are now ready for processing. You can make different ointments and creams, as well as fragrant soaps and oils under the watchful eye of an expert. Herbs are also an indispensable ingredient for cookery classes. Professionals will demonstrate how herbs can be used to flavour various dishes. There are also courses for youngsters, such as in the Hochkönig region, where you will find a herbal workshop for children, where they can learn all about medicinal herbs. At the many Bauernherbst processions in SalzburgerLand, local folk groups demonstrate traditional dancing and whip crackers can be seen popping their whips on horseback. Local groups also illustrate how goods were transported across the Tauern mountains centuries ago.